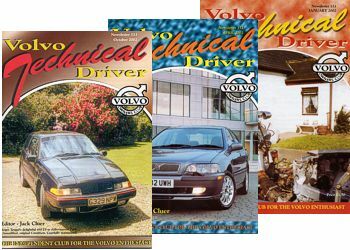 Club members used to receive three Technical Driver magazines each year, between issues of Volvo Driver magazine. Technical Driver contained technical advice and tips, and letters from members who have carried out work on their own Volvos, and their experiences with their repairs. These issues are now archived on this web site. The technical pages are now incorporated in the regular Volvo Driver club magazine. The first step is to go to the web site Search page and search there for any document that may help answer your enquiry. The other option is to use our very active FORUM. Current members of the Volvo Owners Club can contact the Register Keeper for their model of car. You can find their contact details in the club magazine, or email them from our MEMBERS CONTACT FORM. To access this you will need the password and username from the current issue of the club magazine Driver. We cannot guarantee to be able answer all questions especially for the newer generation cars that have complex electronic systems. A very good summary of the technical changes (and related benefits) made to the N series engine late in 1999. 850 Repair and Maintenance Documents. Article by TME engineer Marco Alsterfalk. Article on how Aquamist helps with engine tuning. C70 Convertible soft top roof damage. Cause and cure. Statement from Volvo Car UK on this issue. Electronic Throttle Module (ETM) Issues. Fuel Saving. Useful web site on fuel saving tips. Load carrier rails (PDF). Fitting instructions. M.O.T. UK web site explaining all about the MOT test and what is checked. Oil - Gear Oil FAQ from Opie Oils. Unleaded Fuel and LRP. Converting your Volvo to run on unleaded fuel. UK models only. Volvo car production statistics and information. How speed affects stopping distances. (PDF)This applies to all vehicles. Glass mounted GSM antenna (PDF).